The Internet is an excellent resource for information for learning how to make an origami frog, with dozens of websites and tutorials dedicated to this fun shape. For many Americans, frogs call to mind the pre-transformation princes of fairy tales and the creepy dissection projects from high school biology. However, in Japanese culture, these amphibians represent good fortune. In fact, they are so associated with luck that Japanese tourists often carry frog images when they go to Las Vegas. The word for frog in Japanese is "kaeru," and this word has a second meaning as well: to return. Because of this, frogs are popular gifts for those going on vacations or taking any kind of long voyage. 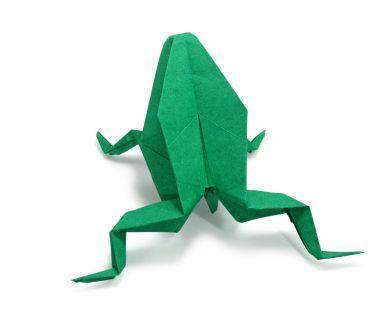 You might consider making an origami frog as a send-off or as a good luck symbol for a friend. How to Make Origami Frogs from University of Wisconsin Sea Grant offers very detailed, step-by-step instructions with great diagrams. This is an excellent resource for learning this shape. Origami Instructions has a very good series of photos with accompanying directions. Although there are many steps to this project, you'll be rewarded when you can actually make your frog hop across the table. Save the Frogs also has diagram-based instructions for making a jumping origami frog. This set of directions has 11 steps which are easy to follow. Once you find the right method of learning how to fold frogs, it is a great project for anyone to add to his or her origami figure collection.